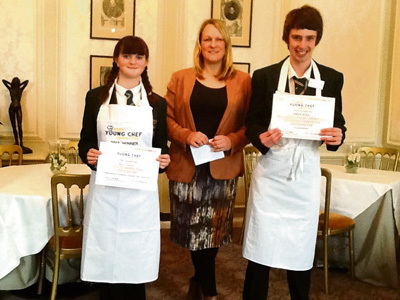 A pupil from Wellsway School proved she has the recipe for success, scooping the title of B&NES Young Chef of the Year 2013. Hatti Prescott’s dish of cod wrapped in pancetta with herby potatoes and traffic light ratatouille won over the judges in the finals of the contest, held at Ston Easton Park on January 22. The fourteen-year-old was up against competition from 13 other finalists from seven secondary schools in the district. She also won £500 worth of cooking equipment for Wellsway's food technology department, with students being asked for their ideas on what to purchase. Fellow Wellsway pupil Callum Bishop also won through to the Young Chef of the Year finals, which were judged by a panel including Ston Easton Park head chef Dan Moon, Judy Allies, Director of Public Health Award coordinator, and Sam Moody, The Bath Priory's executive chef. Both Callum and Hatti say they are looking forward to entering other cooking competitions.